To my surprise, it wasn't very difficult to get hold of Andreas Groß, managing director of Heinz Berger Maschinenfabrik, a company based in Wuppertal. Although we had never met or talked before, we held a one-hour conversation about technology, robots and grippers, about polishing paste, pots and pans. I learned more and more about the giant plant with 33 robots for which Heinz Berger has won this year's Robotics Award. When I hung up the phone, I wondered why this man had taken the time to talk to me in the first place. As it turned out during our conversation, not only is Andreas Groß managing director, but he also manages the construction department and developed the plant. Moreover, he's the head photographer in his company and responsible for photographing and videotaping the finished and still perfectly clean plants. And very obviously, he also takes care of the specialised press. 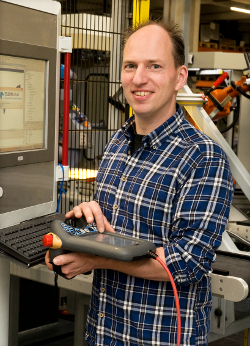 But first and foremost, Andreas Groß is a robotics specialist to the core. 'Heinz Berger Maschinenfabrik recently celebrated its 60th anniversary,' Berger tells. 'We have implemented about 700 robot integrations over the past 20 years.' Every year, the Wuppertal company installs between 40 and 70 of these steely workers. So if a job involves the construction of a plant with 33 machines, this really is a large-scale project for the specialist from the "Country of Berg". He has acquired this new knowledge about cookware quite naturally, because the plant processes WMF's entire range of pots and pans. While the untreated pots enter the plant from the deep-drawing press on one side, almost ready-for-sale models, perfectly polished to a mirror finish on the inside and on the outside, leave the plant on the other side at intervals of 10 seconds. All that's missing are the handles, the lid and the price tag. The entire process is automated. The plant, which is supervised by two employees, houses 33 robots that slave away under almost unimaginable conditions. 'Polishing is dirty work,' as Groß gets to the heart of it. 'Dirty polishing paste is splashed around in the cells round the clock.' But the technology must work reliably nonetheless. The difficult environment was one of the reasons why it took almost three years to develop the plant. 'Many employees were involved in the design, in the preliminary works and in the construction,' Groß tells. 'One process engineer spent almost two years on site, monitoring the production and training of the staff.' Andreas Groß himself went to Geislingen at least twenty times. 'In the beginning, things didn't run smoothly, but that's normal,' the managing director admits. That's exactly what Industry 4.0 is about: decentralised intelligences that process input signals from which they deduce consequences such as tool changes whenever the workpiece, i.e. the pot or the pan, changes. In this case, the plant changes its setup in a fully automated way. It doesn't take longer than 2.5 minutes, and no worker in the hall needs to turn any screw or press any button. An intelligent switch recognises the provided workpiece. Following a plausibility check, all 33 robots change their setup autonomously one after another. The plant prepares itself for the new workpiece, so to say. The short formula might look like this: new pot, new program. But it's not that simple, because all the workpieces that are inside the plant are further processed at the same time. Processing and changeover occur in parallel. While the plant grinds and polishes, it changes its setup nonstop (see also interview). Such an unshaped piece of metal – freshly from the press and completely untreated – doesn't really look like branded cookware. Even a layman can see that there's still a lot to do. However, that the part is tackled by as many as eleven robots is actually quite remarkable. In practice, each pot or pan passes through a complete robot line. The first six machines process the workpieces on the outside, while the remaining five robots work the inside. Before the process can even start, the robot must grip the pot properly. The Wuppertal company developed a combination gripper specifically designed for external machining. Using vacuum, this special gripper attaches itself to the bottom on the inside of the pot while at the same time extending a spreading tool. 'Just imagine you put your right hand into the pot and spread your fingers,' Andreas Groß visualises the process. 'This is more or less how our gripper works.' And Groß has every right to call it "their gripper", because the part was developed in Heinz Berger Maschinenfabrik's construction department. The development took almost one and a half years. Round one of the external machining process starts once the pot has been fixed by the combination gripper. The unmistakable deep-drawing marks are ground off from the bottom and the curved surface areas. These are typical wavy lines on the surface caused by irregularities in the circular blank on which you don't have any bearing whatsoever during the deforming process. All this must have been ground smooth before the next work process starts. In order for the product to look good when finished, and to avoid that it causes any injuries, the pot's so-called pouring rim is ground smooth as well. The robots share all operations in different processes and with different tools. Once the grinding process has been completed, the outer surfaces are polished and buffed. While the substrate already provides all components required for the grinding process (abrasive and bond), polishing only works with additional polishing paste. The polishing disc itself is controlled by the robot. The desired abrasion is achieved by the grease and the abrasive grits contained in the polishing paste. Andreas Groß and his employees therefore had to find a way to bring the polishing paste between the polishing disc and the workpiece – always in the right quantity and in the right spot. During the development of the plant, it was especially the correct position that turned out to be a challenge, because a polishing disc changes over time. At the beginning, its size is 500 mm in diameter. However, after polishing a thousand pots, there are only 300 mm left. This change is actually quite significant when it comes to the automatic application of polishing paste. That is why the Wuppertal company mounted a so-called high-pressure polishing nozzle above the disc. At a pressure of 15 bar, it fires between 2 and 6 mm3 of polishing paste between the pot and the disc. This is done at regular, programmable intervals. However, the nozzle must hit the right spot without any deviations. Since the polishing disc shrinks in the course of its use, it's a moving target. As an example, the disc radius reduces by 100 mm. Since the polishing paste must always be applied exactly between the workpiece and the tool, this travelling distance is compensated by a variable launching angle, something of which the robots take care as well. They adjust the angle at which the nozzle fires the paste. According to Andreas Groß, this technology is "brand new and absolutely stunning, something that has never existed before." Not only is the robot-controlled adjustment of the polishing paste nozzle unique, but it is also inexpensive. 'Our solution costs less than EUR 10,000. With 33 robots, it's a big difference whether this detail costs EUR 10,000 or twice as much,' Groß emphasises, and justifiably so. Well-equipped with the right polishing disc and a sufficient amount of paste in the right place, the robots set to work, giving the cookware its final, shiny surface. The remaining five robots are intended for processing the pots and pans on the inside. The individual work steps from grinding to polishing to buffing are repeated. This work process also uses a special gripper developed by the company. The principle is the same. It uses vacuum to attach itself to the bottom of the pot. The cookware rides this ghost train for about 30 seconds. And since there are three of those lines, the finished products are discharged at intervals of 10 seconds. Like everything else in this plant, the tools are also changed automatically. Obviously, a small saucepan with a curved surface area of 70 mm requires another polishing disc than a 300 mm high pressure cooker. The polishing discs don't just differ in their diameters, but also in their weight. While the narrow model weights about 25 kg, the wide disc is a heavy weight of 80 kg. The grinding tools used by the robots for processing different areas of the workpiece need to be changed as well. Polishing discs are never totally round, which means that they wobble during the process. That is why the tool must be pressed against the workpiece with considerable pressure. 'If you hold the disc against the workpiece like a girl, you can polish forever without achieving any results', Groß knows, which is why the plant is equipped with heavy-duty robots that are able to apply between 50 and 80 kg grinding pressure. In this specific case, we're talking about KR 180 models made by Kuka and designed for a maximum load of 180 kg. These robots are strong, change their setup in a fully automated way and take care of the polishing nozzle adjustment. But they also involve flesh-and-blood colleagues. The robots always know how many staff members are present in the hall. Usually, the plant is supervised by two workers who, amongst other things, have to provide the polishing discs that are gripped by the robots. Each robot knows how long its tool stock lasts, but it is also aware of the other models' stocks. And since all robots are networked and able to communicate with each other, they can coordinate their stocks and avoid conflicts. One example: Robot no. 13 can foresee that its stock of polishing discs is going to decline along with that of robot no. 17. So two hours before that happens, it instructs a worker to get supplies from the warehouse, just to be on the safe side. This optimises the plant capacity while at the same time avoiding the most feared scenario: expensive downtime. There are different possibilities for the robots to get in touch with the worker. One option is their mobile phone. Besides, the jobs are displayed on screens mounted in the hall. Although the robots work under such adverse conditions, the Wuppertal company has succeeded in guaranteeing the required availability of 95% for the entire plant. This means that each robot must work with a reliability of 99%. 'Last but not least, also the spindles used for the polishing discs are supposed to function for years despite all the dirt,' Groß emphasises. But in the end, the specialists from the Country of Berg also managed to get this problem under control. "The plant reconfigures itself permanently"
Mr. Johann, many obstacles had to be overcome during the development of the plant. Would you say that one of them presented the biggest challenge? What was the most demanding task during the implementation? Actually, the entire project was a big challenge, especially for us as a medium-sized company that usually doesn't build plants of such a scale. Particularly exciting was the task of making sure that each robot knows, at the right time, which type of pot must be processed. The entire plant prepares itself for this pot and changes its setup automatically. The pot determines the program. But the pots that are still inside the plant will be finished at the same time? That's correct. The plant reconfigures itself permanently, but doesn't stop to process the workpieces. While one robot polishes a pot, the other changes the tool or the gripper for the next pot in line. The setup process takes place everywhere in the plant, which is very fascinating. You stand next to it and watch how everything changes as if by magic. Of course, this has nothing to do with magic, but with sophisticated control technology. Did the customer request this kind of concept? We had to proceed like this. Otherwise, we wouldn't have been able to achieve the requested product changeover time. We cannot empty the plant before inserting a new product. The development of the plant took three years. During this rather long period, did you ever have any doubts as to whether you would achieve your goals? Our managing director never had any doubts. We all worked together, looked ahead, divided our tasks and assigned them within the company. Thanks to well-coordinated collaboration, we succeeded in completing this large-scale project. Let's be honest: Were there any specifications that fell by the wayside? That's a good question. The specifications stipulated by the customer were comprehensive. In the end, we succeeded in completing the project within the specified timeframe. Including things whose solutions we hadn't known at the beginning. In those three years, we also developed brand new ideas. The polishing paste supply system. Something we had been procrastinating for too long. The robot sort of grabs the paste nozzle and pushes it into the right position. And we don't need any additional drives. For a long time, we hadn’t been able to imagine a matching solution. We had feared that this would turn out to be a huge problem. But then we had this brilliant idea. For how long will the plant be operational? For at least ten or even twenty years. Maybe even longer. I've been working with Heinz Berger since 2005 and all the plants that I've built are still running. The jury really proved its competence when it determined the winner of the 2018 Robotics Award. Due to the limited application possibilities, it wasn't really possible to demonstrate the true scope of abilities of the complex plant developed by Heinz Berger Maschinenfabrik. The video the company had sent in along with its application couldn't offer more than a first impression. What I found out during my research: My goodness! The solution is Industry 4.0 at its finest and really deserves the gold medal. Benjamin Johann, control engineering project manager at Heinz Berger Maschinenfabrik in Wuppertal. One of the first steps for the machining of pots is grinding the transition between the bottom and the shell surface. While grinding the inner shell surface the robot holds the pot by vacuum system. As with everything in the line, the changing of the huge polishing discs is made fully automatically. This working station mirror polishes the shell surface of a pot.